Please select a topic from the right hand side to view information on bands, DJ's, venues, festivals, dance competitions, fundraisers etc. 50's Rock & Roll dance teachers Carol and Kevin became engaged. They were teaching on Mon nights at the Anglican Church on Burwood Hwy for $5 a class. Ray was starting up junior dance classes, Teresa Mileto started running monthly dances at Coburg Town Hall from March 1996, with dance competitions, $12 entry, with Adrian running dance classes there as well. Adrian Spadaro and Chris Black ran a dance at Mordialloc Community Centre with band "Brassworks" and guest teacher Sylvia Sykes from the US taught the shim sham. Merv Benton played at the Moorabbin Town Hall, the Starliners and Wild Turkey with DJ Wolf played at the Waltzing Matilda Hotel, The Premiers and DJ Jeff played at Clayton RSL, $8 entry. Ararat Jailhouse Rock festival was held in March with bands including Eddie Youngblood and Flashback. The Rebel Tavern in Seaford had bands every Thursday, Friday and Saturday nights with $5 entry. The Straight 8's played at the Monash Hotel, $8 entry, Aspendale, Box Hill, Clayton, Frankston, Spotswood, Rye, Springvale RSL's all had live bands on Fri or Saturday nights, Just Rock in Kilsyth had Fri and Sat night monthly social dances, Pitrones in Keysborough had bands every Wednesday night, Good Friday Children's Hospital appeal was held at the Moorabbin Town Hall on 4th April with the Allstars, Donna Fisk, Johnny Chester, Andrew Portelli, Bill O'Rourke, Grantley Dee, Steve Lawson and Oscar Swaru, $20 entry. The Australian Rockabilly Accociation held a dance with the Straight 8's and Jump & Jive at Caulfield Secondary, $15 entry. Line dancing / bootscootin was popular with classes held all over Melbourne, live bands playing on Wed nights at Italo Australian Club Dandenong on Wed nights and San Souci in Moorabbin on Thurs nights, plus a monthly gig guide / booklet "Heart of Country News". I first stumbled on the rock n roll dance scene in 2004. I was asked to dance at our local club by James Wing, who had come along to watch a band called Shindig. James taught myself and 3 girlfriends how to do a couple of basic rock n roll moves and told us about the dance lessons at the Waltzing Matilda hotel in springvale. He also showed us a copy of the Rock n Roll News, opening our eyes to the rock n roll dance scene. We were all excited to learn that there was somewhere we could go to learn to dance, so the next week we went along to the "Waltzy" and started lessons with Glenis Boyd's Southside Rockers. That became a regular girls night out every Tuesday and Sunday night for the next 2 years. Our husbands came a few times but weren't interested in dancing, - I think they were secretly pleased to have a night at home in charge of the TV remote. It wasn't long before we heard about "Little Marias" dance at the Whitehorse Club with a live band, and we soon became regulars there until Maria closed down in 2013. Devastated at loosing our regular fortnightly dance I pursuaded Milton and Sue from Flipside music trivia into having a go at running a rock n roll dance. The Flipside dance at the Hungarian Club was born, running twice a month for 5 years until it sadly closed at the end of 2018. Over the years I've enjoyed dance lessons from Glenis at Southside Rockers, Graeme and Heather at Sylvester Swingers, Pat Noakes at Swing Central, Adrian Spadaro at Red Hot Rockers, Lou, Lynette and Graeme at Top Cats, Andy Zammit at Andy's Cats, Jon Hannon at Alley Cats, Swing Patrol, Rusty at Ashburton Swing, as well as several other one off classes and numerous workshops and festivals. All of the teachers have put lots of effort into spreading their love of dance and helping their students to learn new moves. Over the past 15 years I've met lots of wonderful people, travelled to suburbs I'd never heard of, danced to many wonderful bands and had a great time. I've also sadly said goodbye to many characters who have passed away. We are so lucky to have great dance teachers, bands and dance promoters who are willing to take a risk at putting on dances for our enjoyment, as well as so many places to dance and hear great music. I decided last year that it would be worthwhile creating a website to record some of the history of the dance scene so that it doesn't get forgotten. I hope you enjoy reading people's memories and I hope they keep rolling in so together we can continue to record the stories of Melbourne's rock n roll dancers. In 1995 the following rock n roll dances and classes were being held around Melbourne. Large town halls were popular venues, line dancing was very popular, and Lindy Hop was starting to be danced. Rock n Roll with Lindsay and Heather in Mornington Wed nights. Sebastians Rock n Roll & Swing, Preston Mon night, Moonee Ponds Tues night, Blackburn Thurs night and Glen Iris Sat arvo, $9. Also line dancing lessons on the same nights. Flipside dance at the Hungarian Club closed after 5 years of fortnightly dances. Speedsters band retired after 30 years of playing at rock n roll dances. Adrian Spadaro held a retirement dance in April at the Whitehorse Club to say goodbye after 25 years of teaching rock n roll and running dances. RocketApp was launched by Jon and Zoe Hannon. Buckley Park dance taken over by Phillip Pananche and Agatha, 2018, then Rhonda and Phillip alternating. Cool Cats Club established with Facebook page and Website with the same name designed to promote not only Buckley Park events but all R&R events happening across Victoria. Apart from those who have been inducted into the VRRDA hall of fame, there are many other contributors to the Rock n Roll dance scene in Melbourne and Victoria. Grant and Maryanne Richards – Team Richards are teaching kids to dance (and compete) for free in their home in Cranbourne on Saturday mornings, to promote dancing to a new generation. Grant and Maryanne have also won many dance competitions all around Australia. Paul Wan - Jitterbug, Moderator of vicrock.com.au. Paul videos many bands and dances to record the rock n roll dance scene, posts many reviews on vicrock.com.au and attends and supports as many dances and festivals as he can. A great ambasador for the rock n roll dance scene. A popular Rock'n'Roll line dance frequently seen at Classic Rock venues in Melbourne Australia in the mid to late 2000's. The sequence was developed by Les Maslin and the music is "Pennsylvania 65000" by Brian Setzer. Note video's do not display in Internet Explorer. Jon Hannon and Irene Amos were winners of the Le Classique dance competition at Adelaide's Rock n Roll Dance competition in the late 1990's. Video of the Maltese cha cha line dance from the Jukebox Rockers annual rock n roll festival in Geelong, Jan 2019. The line dance is a modified version of the "Stroll along cha cha" and was introduced to the rock n roll dance scene by Rhonda Watts from Renegade Rockers around 2016 after seeing it on a holiday to Malta. It was one of the most popular line dances in 2016-2018 and was danced to the song "Last night"by Chris Anderson and DJ Robbie. 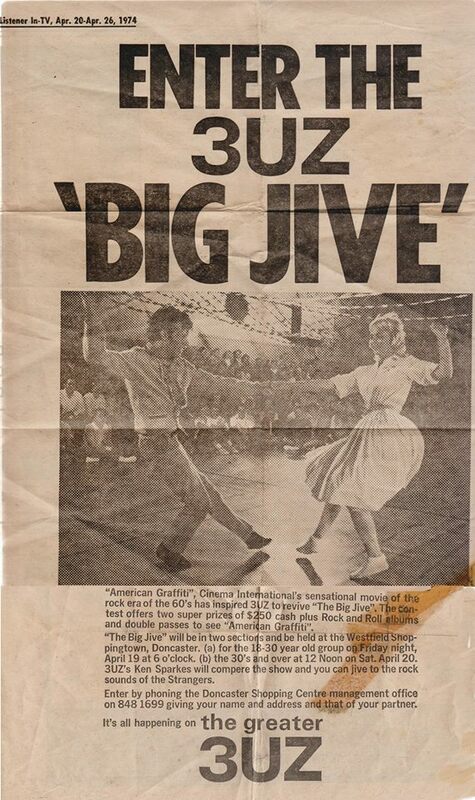 To promote the release of the movie "American Graffiti " radio station 3UZ held a jive dance competition at Doncaster Shopping Town in 20th April 1974. Michele Clay Van Sprang entered with her younger brother, with no rehearsal. The competition was suppose to be on a Friday night but was cancelled and transferred to Saturday afternoon. They entered at the last minute as a joke on the say so of friends that they were good enough to win. To see video f the competition go to the "History of rock n roll dancing in Melbourne" Facebook page. Thanks to Michele for photos and information.